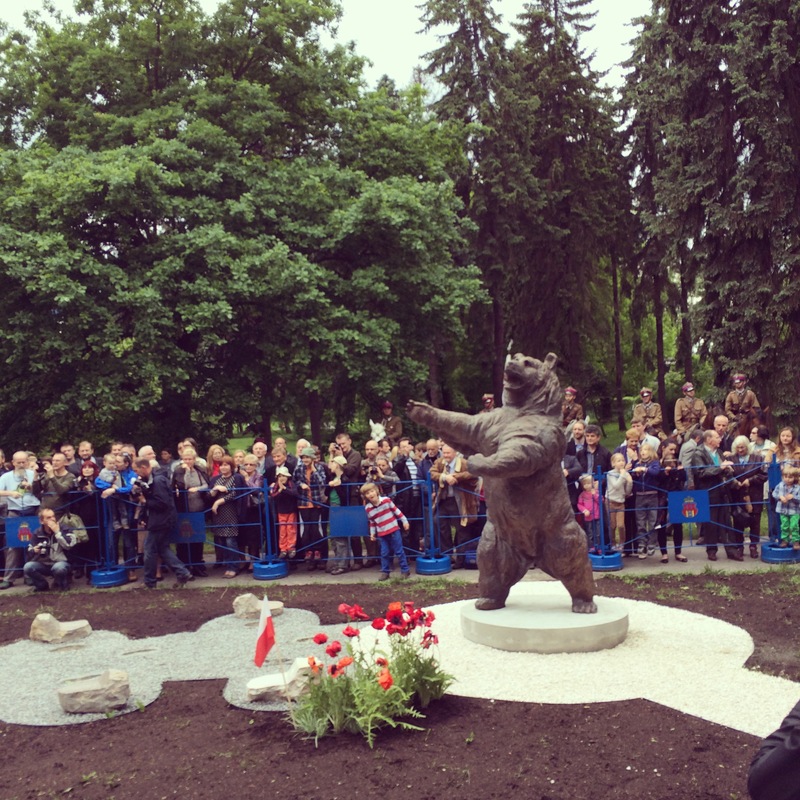 On 18th May 2014 a Wojtek The Soldier Bear statue was unveiled in Krakow’ Park Jordana. I’ve never been associated with such a project in such an important location. I want to pay tribute to many of the people who made this possible, and share a few lessons learned. I’ve said on many previous occasions how much this project is the result of other people’s work. As the person responsible for gathering examples of good practice and distributing it far and wide I am often seen as carrying the work load on my shoulders – but it isn’t true. I am sure there are people who helped who either I don’t know about or who I’ve forgotten. As people who know me realise, I have mild prosopagnosia (face blindness) meaning that I may have forgotten people who I’ve met. Apologies in advance. I can edit this article if there are omissions. In some places the tone of this article may seem a little resentful. The journey has been a long one, and I’ve had my share of repressed frustration and anger along the way. On the outside I tried to keep up a sunny optimism, while internally sometimes being upset at the lack of action to follow up declarations of support. Overall the experience of this project has been good, I’ve got to know some wonderful people, and I am very happy that we have a positive ending. I know that my difficulties were trivial compared to the experiences of all the people whose terrible experiences at the hands of the Soviets and fighting the Nazis I wanted to publicise. At the same time I hope sharing can be useful,even if the lessons are not always clear. Back in April 2013 I wrote an account of what happened up to the City Council’s decision to approve the idea of a statue. This event was marked by Professor Norman Davies attending a press conference. The fact that figures of such internationally stature lend their name to the project is really something to appreciate. At the unveiling I gave a speech in English (and not very good Polish) about the project. The English text is at the end of the article. So what has happened since April 2013? There were several types of activity going on, some things I did worked, others didn’t and were very frustrating. The on line activity of promoting events on Facebook was easy and high profile. Finding people who would actually spend time doing things was not easy and because I didn’t have a team (other than Wojtek Narębski here in Kraków). 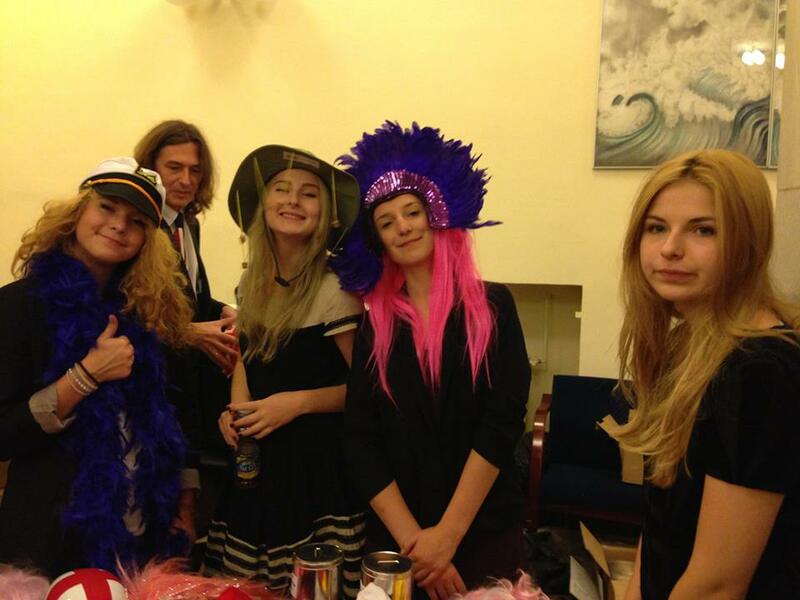 Many of the things we tried were not at all successful in terms of fund raising. I am not sure what the lesson is. It would have been possible to give up, or say, better not to start until you have a team. An alternative view is that if you believe in a cause you just keep going. The scale of the work connected to statue design and build,the planning permission, construction permits is hard to put into words. This was led by Kazimerz Cholewa, with some input from Wojtek Narębski and myself. They did so much work towards getting the statue built. It would have been very difficult for anyone else to have managed the complexity of such a project. The planning, the casting, the paper work, the labour, are hard to adequately communicate. This video of the transportation perhaps gives a sense of the work involved. The budget of 55,000 zloty was somewhat over GBP11,000, and included a lot of people working for free or at cost. We decided we wanted a high quality bronze that would last for generations. As I discovered, raising so much money was almost beyond me. Fundraising This effort can be compared to a leaflet drop or direct mailing. We made many tries, most of them ineffective and had a lucky break. I told friends that fund raising is not my strength, and I lacked someone to support me in doing the work needed, other than the tireless Wojtek Narębski. The first major donation of GBP 1000 (about 5000 złoty) was from Krystyna Ivell who herself organised Wojtek events in London and published an album about Wojtek. Mariusz Szymański the producer of The KTP Last Night of the Proms in Krakow concert and a friend allowed me, Wojciech Narębski my children and their friends to try collecting money. 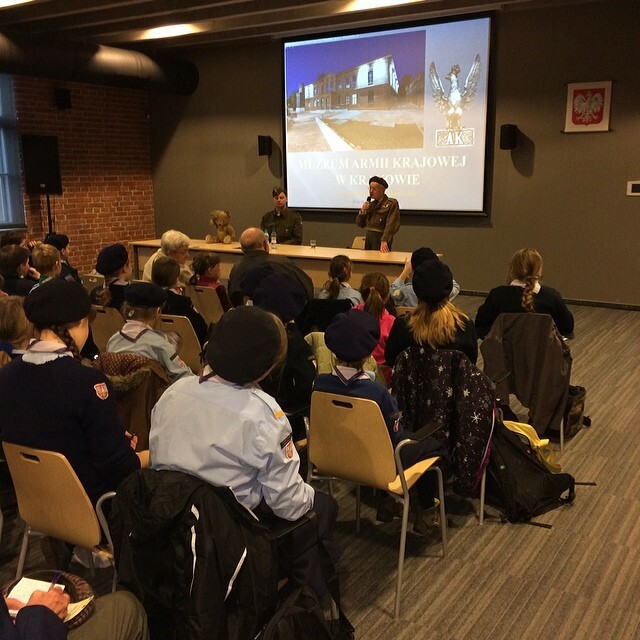 Doing the event did help spread the word about the Wojtek history. 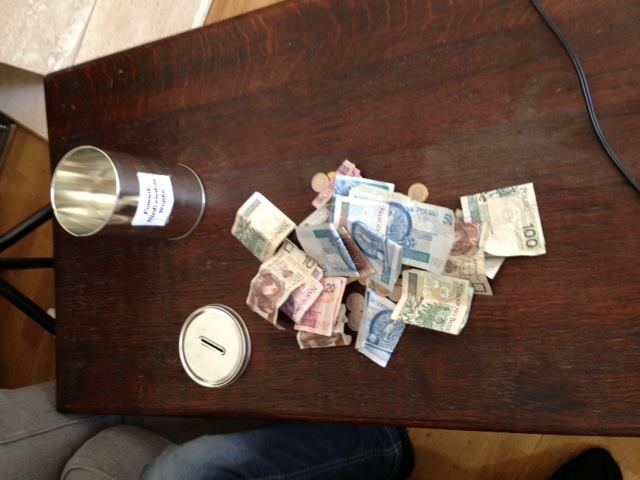 However, my business brain told me that the amount of time and trouble we spent to raise such funds was irrational. We got 905 złoty and I had the strong realisation that this was not an effective use of Wojtek’s energy and time, mine or the other people involved. 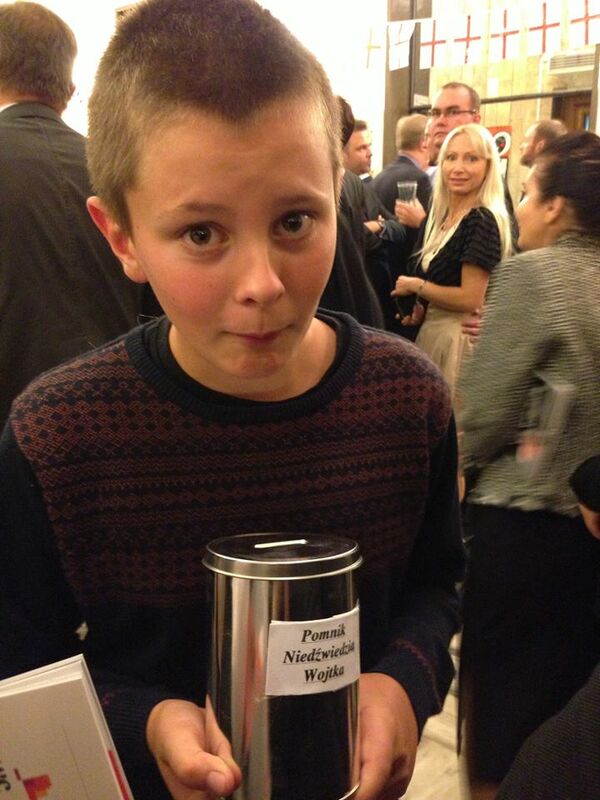 When I saw Wojtek putting his own money in the tin I felt positively uneasy. We didn’t have other ideas at this stage, and were getting lots of verbal as opposed to financial support. Krystyna Sadowska from Krakow Technology Park suggested that she could get us in front of a group of the most successful business people in the region at their Annual Business in Małopolska gala event. Barbara Wityńska also helped. Things ran late and Wojtek Narębski and I spent a long time waiting to go on stage for three minutes to talk about the statue, received warm applause and about 420 złoty over the next few days. If it had been possible to send people to the tables with collecting tins, I think we could have raise much more. There are formats involving auctions where donors are visible. But I didn’t have the time or people to help me do that kind of thing. After taking Wojtek Narębski home, I gave a presentation at the Talking Dog festival on the same evening, which didn’t raise a single złoty. People suggested that we do a Kickstarter, Indiegogo or Polak Potrafi campaign and with Wojtek Narębski and Kazimierz Cholewa we recorded a number of videos. Here is Wojtek in English and Polish I did a recording with him here with filmed ourselves together here and Kazimierz Cholewa here Ewa Spohn offered to be the UK Fundraising vehicle (you needed to be a resident in the UK to use Kickstarter). However I had heard from many sources that you shouldn’t start a campaign unless there is a PR initiative prepared, and I didn’t find a volunteer to do this. Maybe the video appeals helped, but I don’t know. One of Krakow’s most successful companies Integer SA Inpost posted links to our project on their Facebook page. Wioletta Sosnowska and her school in Żagań organised the first Polish Wojtek statue, and has worked tirelessly to promote the history. This was unveiled on 3rd June 2013 and Katy Carr, Agata Dziekan, Dorota Kulawiak, Wojciech Narębski a delegation from the UK, attended. This triumph helped mobilise us all, with the knowledge that a Wojtek statue really was possible, and gave us a renewed sense of shared purpose. Marek Wisniewski, Sławomir Ptaszkiewicz helped organised a workshop with Wojtek Narębski and Ewelina Olaszek about the Wojtek history for youth groups in Maly Rynek in Krakow. A report on local TV here covered the event ( 7.49). We raised 20 złoty. It was here that the breakthrough happened when a friend Andrew Targosz – a local businessman – who was there with his children – heard how we were struggling to raise the money we needed. A couple more conversations led us to agree that we would cover the remaining costs between the two of us. While I always intended to make up any shortfall had never wanted the funding of the project to be covered by me alone. 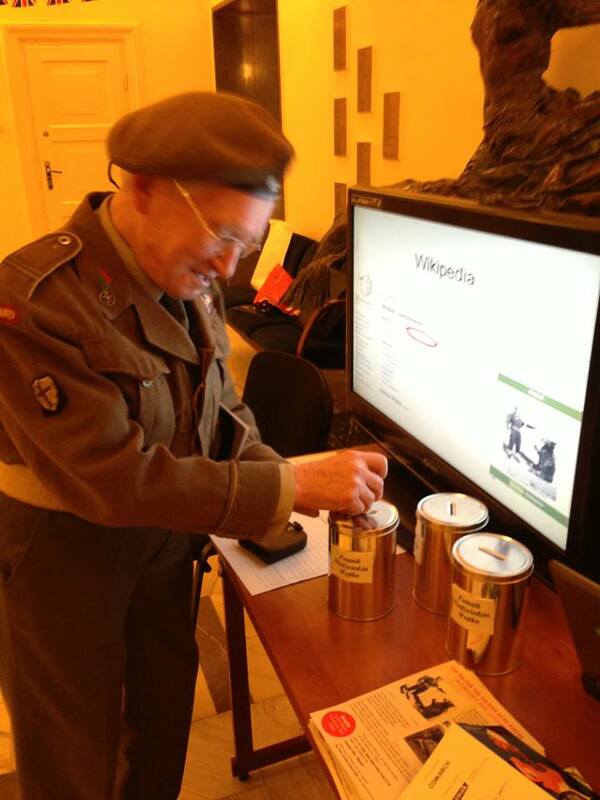 I realised that thanks to Andrzej Targosz we had a chance to have the project completed by the 18th May Monte Cassino anniversary. I want Wojtek’s statue in Park Jordana to be a catalyst for further propagating information about the history surrounding Wojtek – and fund raising for the Park. I hope that authorised miniatures of the Statue can be sold with profits going to the Park; that some self financing programme of guides and information can be developed so that the increased awareness of Wojtek leads to increased knowledge of the history. The most enduring personal benefits for me of this entire project has been the privilege of getting to know so many wonderful people, and none is more inspiring that Professor Wojtek Narębski. If I ever feel tired, demotivated or down, I remind myself that there are people like him and he – like Wojtek – motivates me to keep going. Enabling Wojtek to tell his life story on the TEDxKazimierz stage – as can be viewed here – is something that I will always be proud of. Ryszard Antolak, Vic Baczor, Wojciech Batko, John Beauchamp, Joanna Berdyn, Mark/Marta Bradshaw , Christine Bojen, Marusia Bucknall-Kowalyszyn , Katy Carr, Katy Carr Simon Daley, Professor Norman Davies, Agata Dziekan, Brendan Foley Agnieszka Gis, Vivian Glenn, Nick Hodge, Will Hood, Adam Irski, Krystyna Ivell, Anna Kret Dorota Kulawiak, Mike Levy, Edward Lucas, David McGirr, Kat Mansoor, Wojtek Narebski, Jonathan Ornstein, Garry Paulin, Katarzyna Pętlak-Długosz, Patryk Polec., Angela Riccomi, Raymond Ross, Wioletta Sosnowska, Andrzej Targosz, Billy Stewart, Krzysztof Strzałka, Piotr Synowiec, Kamil Tchorek, Simon Thompson, Andy Traverse (Szawlugo) Łukasz Wierzbicki, Aleksandra Wojcik, Michalina Ziemba. When I had the idea of building a Wojtek Statue in Krakow back in 2008, I didn’t imagine such a wonderful statue in such a perfect location. I am very proud to be associated with the rediscovering and publicising of this part of Poland’s history. but I do not want to focus on this. There are three important things that we should focus on today. 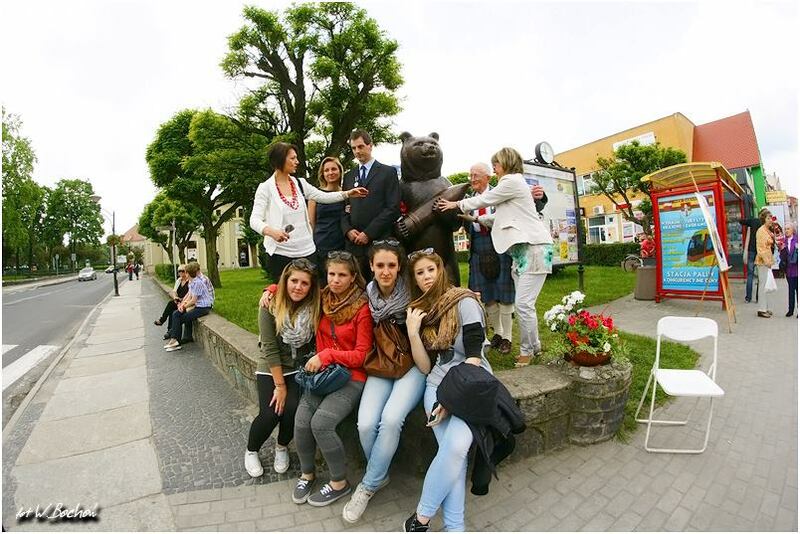 The Wojtek story, the story of this statue, is not about me, my generation, or even young people. Wojtek is a Polish hero who is associated with the fight for freedom. Poland needs popular and attractive symbols and through Wojtek the whole world can hear, learn and identify with Poland’s history. In Putin’s Moscow people are daring to say positive things about the USSR was something positive. Through Wojtek we remember what the Soviet Union really stood for. 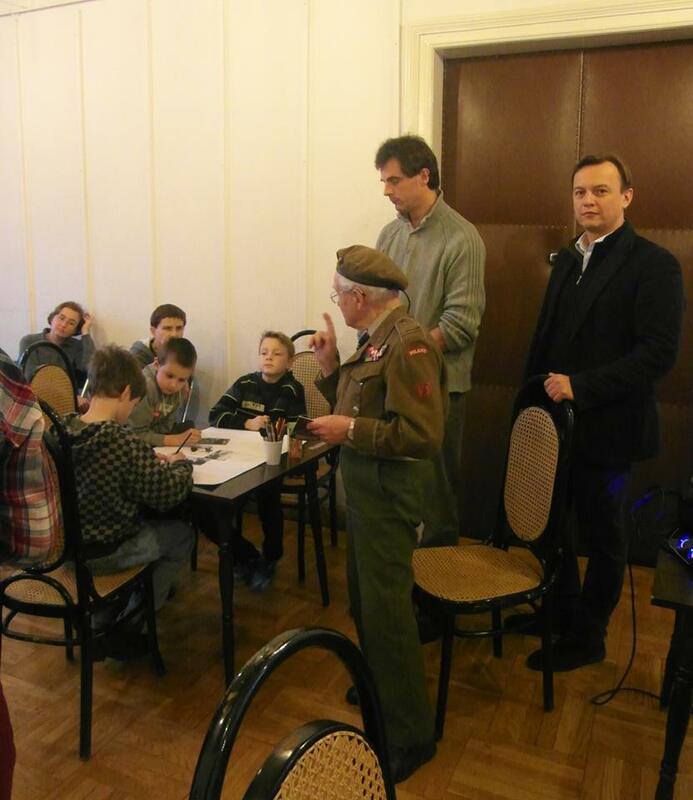 Children love to hear about Wojtek. Wojtek’s journey teaches them history. I want to say thank you. thank you to many generous people who gave their time and money to make this happen. This statue was build with private funds, not your taxes. I will mention Professor Wojtek Narebski – today in Monte Cassino – who remembers Wojtek the Soldier bear. Krystyna Ivell who flew from London and was the first major donor. Both survived the Anders Trek. Prezes Kazimierz Cholewa of Park Jordana, and those who worked with him and Andrzej Targosz whose generosity means that the statue stands here today, Some are here today, others are far away. Please with me, now show your appreciation owe them all. We are united by promoting the memory of Wojtek and those who fought and died with him. 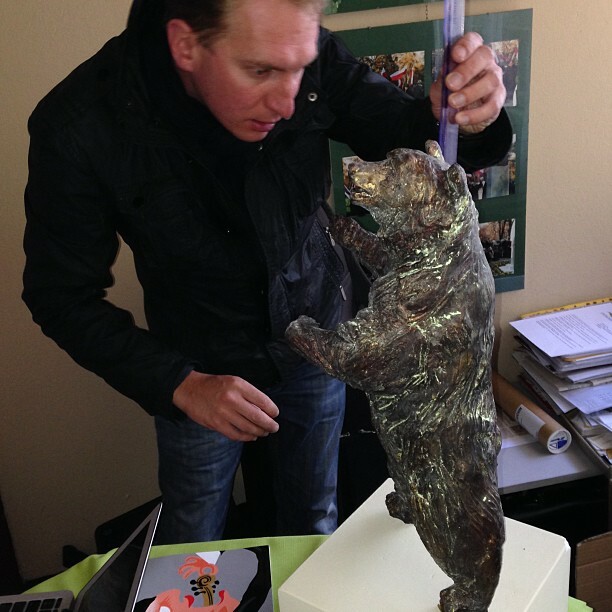 Lastly, I want to tell everyone here that I hope this statue is not the end of Wojtek’s journey. it’s the end of a chapter in the book of Krakow and Poland’s history. 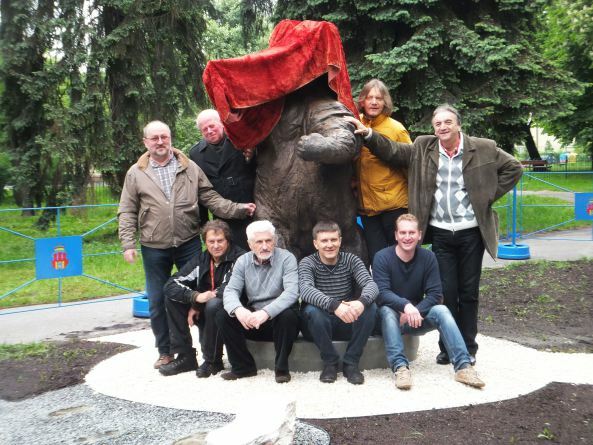 I hope there will be other statues, and other Wojtek projects. around Poland and the world. Wojtek belongs in the hearts and minds of people around the world. If teachers, parents, children, patriots everywhere can be inspired by this statue to launch their own projects in schools, to paint, sing, act – then surely this Statue is something we can be very proud of. More tourists will surely visit this beautiful Park. More people will know about Wojtek, More people will know about the heroism of General Anders and his army. More people will know about the crimes of Stalin. Surely that is something we can all be proud of. 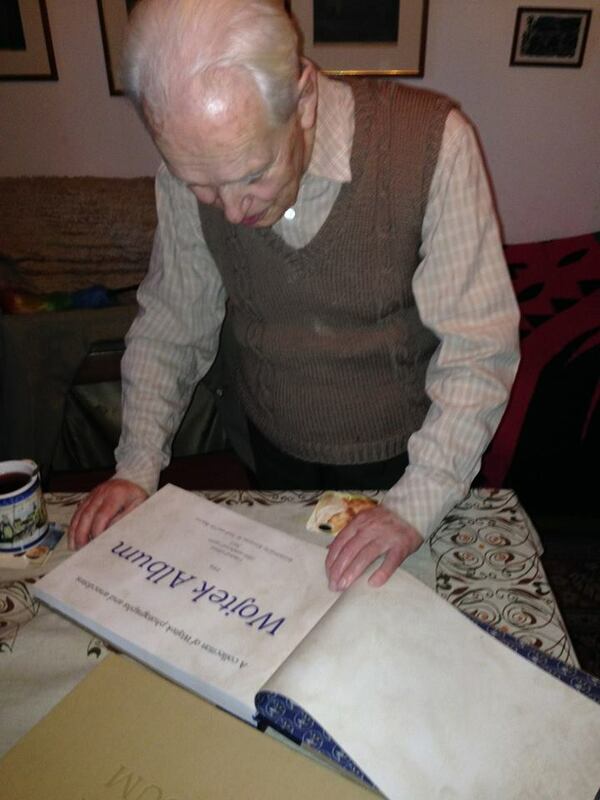 Thank you very much for bringing Wojtek to Krakow. Kiedy w 2008 roku przyszedł mi do głowy pomysł by w Krakowie zbudować pomnik niedźwiedzia Wojtka, nawet nie wyobrażałem sobie tak wspaniałego dzieła w tak doskonałej lokalizacji . Rozpiera mnie duma, że jestem zaangażowany w odkrycie na nowo i promocję tej części historii Polski, ale nie chcę skupiać się wyłącznie na tym. Są trzy bardzo ważne kwestie, których istotę powinniśmy dziś podkreślać. W historii Wojtka i w historii tego pomnika nie chodzi o mnie, moje pokolenie, czy też nawet pokolenie młodych ludzi . Wojtek jest przede wszystkim polskim bohaterem, który jest związany z walką o wolność. Polska potrzebuje popularnych i interesujących symboli i dlatego właśnie dzięki Wojtkowi cały świat będzie mógł usłyszeć, poznać i identyfikować się z historią Polski. Through Wojtek we remember what the Soviet Union really stood for. Dzieci uwielbiają słuchać o Wojtku, a podróż sympatycznego niedźwiadka uczy ich historii . Dziś przede wszystkim chciałbym podziękować wielu ludziom dobrej woli, którzy poświęcili swój czas i pieniądze by doprowadzić do tego wydarzenia. Bo warto pamiętać, że pomnik ten został zbudowany ze środków prywatnych, a nie z pieniędzy podatników. Chciałbym wspomnieć właśnie dziś, w rocznicę bitwy o Monte Cassino, profesora Wojtka Narębskiego, który pamięta Wojtka żołnierza niedźwiedzia. Chciałbym wspomnieć o Krystynie Ivell, która przyleciała z Londynu i była pierwszą z głównych darczyńców. Oboje przeżyli Anders Trek . Dziękuję prezesowi Towarzystwa Parku Jordana, Kazimierzowi Cholewie oraz jego współpracownikom. Dziękuję także Andrzejowi Targoszowi, którego szczodrość spowodowała , że dziś możemy oglądać ten pomnik. Niektórzy z wymienionych są tu dzisiaj z nami, niektórzy nie mogli nam towarzyszyć. Proszę, pokażmy im dziś wszystkim nasze uznanie i wdzięczność. Połączyła nas chęć rozpowszechniania pamięci o Wojtku oraz tych, którzy walczyli i zginęli wraz z nim . Podsumowując moją wypowiedź, chciałbym wyrazić nadzieję na to, że pomnik nie będzie końcem podróży Wojtka . To koniec jedynie pewnego rozdziału na kartach Krakowa i historii Polski. Mam także nadzieję, że zarówno w Polsce jak i na świecie powstaną inne pomniki i projekty dotyczące niedźwiedzia Wojtka. Wojtek jest w sercach naszych i umysłach ludzi na całym świecie. I myślę, że z pewnością będziemy mogli być bardzo dumni jeśli nauczyciele, rodzice, dzieci i patrioci będący w różnych zakątkach świata zainspirują się naszym pomnikiem i uruchomią w szkołach własne projekty, za pomocą plastyki, śpiewu czy innego rodzaju artystycznych występów. 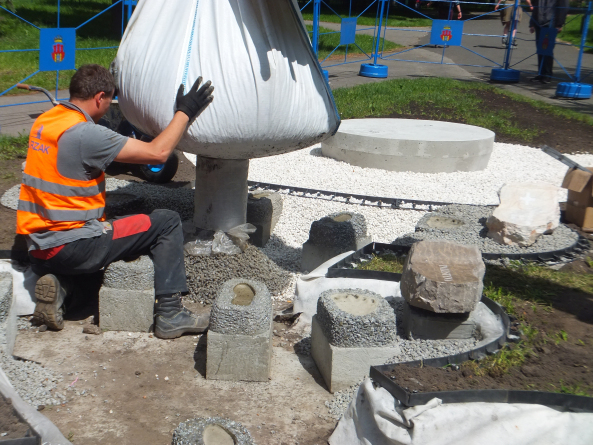 Więcej turystów z pewnością odwiedzi ten piękny park. Więcej osób będzie wiedzieć o Wojtku , więcej ludzi będzie wiedzieć o bohaterstwie gen. Andersa i jego armii. Więcej osób będzie wiedzieć także o zbrodniach Stalina. I ten efekt to na pewno coś z czego wszyscy możemy być bardzo dumni. Bardzo dziękuję za sprowadzenie Wojtka do Krakowa .